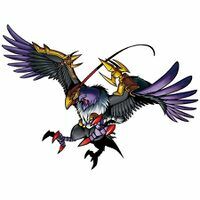 Possessing three legs, it is a bizarre Bewitching Bird Digimon and a subspecies of Yatagaramon. 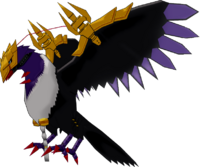 Although its jet-black body presents an evil image to those who see it, it is told that it is the Digimon who guides the chosen to the "Golden Land" in the eastern Digital World. The eastern Digital World is a region where there are still many mysteries, and it is said that the "Golden Land" is protected by multiple sacred barriers. Although it is said that with Yatagaramon's guidance the barriers will be released, traditionally, only those who surmount the "Threefold Trials" submitted by Yatagaramon will finally arrive at the "Golden Land", and it is told that those who were not able to endure the trials are dispatched to the Dark Area. Its Special Move is concentrating the energy produced from the Dokkosho on both of its wings in its forelegs, then firing it (Mikafutsu-no-kami). 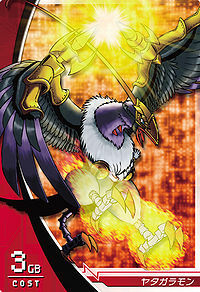 Digimon who have suffered this technique have their digital cells disassembled to a state of "0"s and "1"s. Also, it is able to transform the surrounding 3 km into a dark night by means of its "Haguro", a black light emitted from its jet-black feathers. 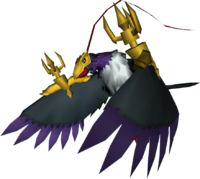 Possessing three legs, it is a bizarre Bewitching Bird Digimon. 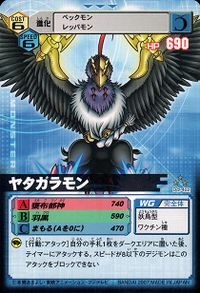 Although its jet-black body presents an evil image to those who see it, it is told that it is the Digimon who guides the chosen to the "Golden Land" in the eastern Digital World. The eastern Digital World is a region where there are still many mysteries, and it is said that the "Golden Land" is protected by multiple sacred barriers. Although it is said that with Yatagaramon's guidance the barriers will be released, traditionally, only those who surmount the "Threefold Trials" submitted by Yatagaramon will finally arrive at the "Golden Land", and it is told that those who were not able to endure the trials are dispatched to the Dark Area. Its Special Move is concentrating the energy produced from the Dokkosho on both of its wings in its forelegs, then firing it (Mikafutsu-no-kami). 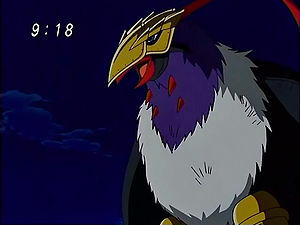 Digimon who have suffered this technique have their digital cells disassembled to a state of "0"s and "1"s. Also, it is able to transform the surrounding 3 km into a dark night by means of its "Haguro", a black light emitted from its jet-black feathers. Possessing three legs, it is a bizarre Bewitching Bird Digimon. 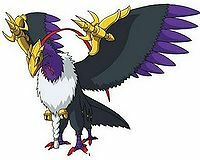 Although its jet-black body presents an evil image to those who see it, it is told that it is the Digimon who guides the chosen to the "Golden Land" in the eastern Digital World. Its Special Move is concentrating the energy produced from the Dokkosho on both of its wings in its forelegs, then firing it (Mikafutsu-no-kami). 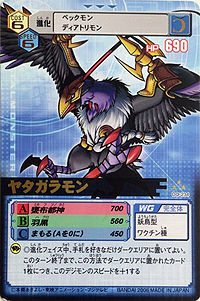 Digimon who have suffered this technique have their digital cells disassembled to a state of "0"s and "1"s. Also, it is able to transform the surrounding 3 km into a dark night by means of its "Haguro", a black light emitted from its jet-black feathers. In addition, it has "Delta", in which it swoops down on the enemy with its sharp talons that shine deep crimson. 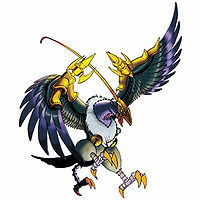 It is a Perfect Digimon that possesses three legs. Its Special Move is "Mikafutsu-no-kami". It fires the energy produced from the Dokkosho on both of its wings from its forelegs. 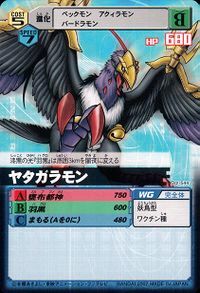 — Digimon Savers: "Smash Kurata's Ambition, Yatagaramon takes Flight"
A Digimon that has the appearance of a crow with three legs. 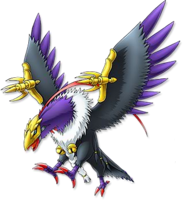 It is able to produce holy energy using the "Dokkosho" on both of its wings. It is told that it is the Digimon who guides the chosen to the Golden Land in the Digital World. Short for Yatagarasu 「八咫烏（ヤタガラス）」, which was a legendary three-legged crow associated with the sun goddess Amaterasu and with victory in Japanese mythology. n., Any of several large oscine birds of the genus Corvus, of the family Corvidae, having a long, stout bill, lustrous black plumage, and a wedge-shaped tail, as the common C. brachyrhynchos, of North America. Anime/Manga Digimon Next: "The Girl Norn!" 甕布都神 N/A Savage Emperor/Spiritual Kick Gathers energy in its Dokkosho and fires it from its forelegs. [N 2] Feather Black 羽黒 N/A Black Feather/Blackout Uses its black feathers to change the area around it to pitch-black darkness for 3 kilometers. 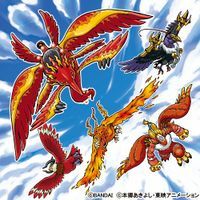 Gurendama  Crimson Ball 紅蓮玉 N/A Fire Jewels Shoots fireballs from the "Dokkosho" on both wings. Gurentsume  Crimson Claw 紅蓮爪 N/A Flaming Claw Attacks with fiery claws. Urin  Black Wheel 烏輪 N/A Sun Bird Creates a small sun and attacks with super heat. Swoops down on the enemy with its sharp talons that shine deep crimson. Fires a golden beam from the dokkosho on both wings. Yatagaramon is the partner of Noguchi Ikuto. 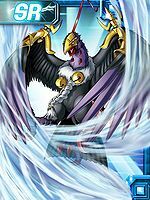 Falcomon evolves to Yatagaramon and kills the first Gizmon XT of Akihiro Kurata in vengeance of the death of Mercurymon. Can be evolved from Peckmon if above level 37, friendship 80%, and Bird EXP 3500, or can be found at Highlight Heaven. Can evolve to Ravmon if above level 50, speed 255, and Machine EXP 10000. 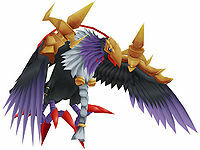 Evolves from Gaogamon, Gawappamon, Geo Greymon, Karatuki Numemon, Peckmon, or Reppamon. Can evolve to Jumbo Gamemon, Mirage Gaogamon, Ravmon, Shine Greymon, or Sleipmon. Can also Burst Evolve into Lilithmon or Ravmon. A being that leads the chosen ones to the Golden Land located in the east of the Digital World. Only those who can overcome the Threefold Trials given by it during the journey can reach the Golden Land. ↑ Kurata's Ambition is Smashed! Yatagaramon takes Flight! ↑ Mikafutsu no Kami, alternatively named Futsu no Mitama is the divine manifestation of a sacred sword wielded by Emperor Jinmu (神武天皇 Jinmu Tennou), according to legend the Yatagarasu acted as a guide for Emperor Jinmu. ↑ Haguro is a reference to a legend associated with the founding of the Three Mountains of Dewa (出羽三山 Dewa Sanzan), which involved an imperial prince who fled to the Dewa Province following the death of his father. In a vision, a three-legged crow led him to Mt. Haguro. ↑ Dokkosho are a specific type of Vajra, consisting of a spherical central section with two pikes at each end. This page was last modified on 24 March 2019, at 00:32.